Is your home suffering from humidity in addition to high temperatures? Does it feel hot, stuffy, and uncomfortable? Making sure that you have the right relative humidity in your home is critical to ensuring your comfort throughout the year. High levels of humidity make you uncomfortable because your skin cannot adequately cool your body down. This is a concern not only outdoors but also inside when our air conditioners are running. While your AC does in fact dehumidify the air during operation, it cannot contend with high humidity alone. Increased mold and mildew: Mold and mildew require dark and moist areas to grow. They are prominent in areas such as the bathroom that are not often ventilated properly. While you may tolerate small amounts of mold and mildew throughout the house, they can begin to spread throughout your ductwork, which is often filled with humid air. When this occurs, the contaminants will be spread throughout the home as they become airborne. A great way to prevent mold and other microbiological growth in your home’s HVAC system is to install UV germicidal lights. Uncomfortable and stale air: Our homes are built to be energy efficient, and one of the side effects of that principle of design is that they are not easy to ventilate during the summer months when we want to keep the cool air indoors. High humidity tends to exacerbate the problem further. The best way to prevent such problems is by installing a whole-home dehumidifier. Unlike a portable unit that you buy from your local hardware store, a whole-home unit integrates directly into your HVAC system at the air handler so that the air extracted from your home, cooled, and returned into the living space is thoroughly dehumidified according to your specifications. This can also be a great way to cut down on energy costs—lowering the humidity may allow you to raise the temperature a bit on your thermostat. 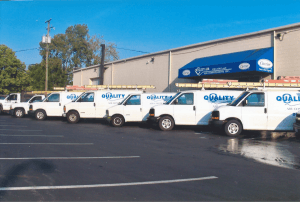 For more information about improving your air conditioning in Columbus, call Quality Air Heating and Air Conditioning today!